I often am amazed at how our seasons work and our expectations of the garden. By this I mean, here it is finally May - Full on Gardening season, and yet I find myself expecting my garden to be supplying me already with a bounty. Actually, truth be told, I was expecting it a couple weeks ago.. 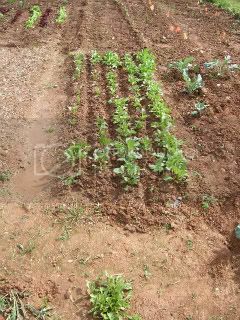 Standing out there with my seedlings, almost in drill sergeant mode.. Yelling "grow Grow come on move it move it!" then scratching my head, reminding myself, We just past our last frost date yesterday.. will I ever find the elusive virtue of patience? This week was tomato and pepper planting week. I started all my peppers in a friends greenhouse. Wow is that nice to have at your disposal. The Starts were really ready for the ground. Last year, if you look back at my tomato sauce posting, I had grown 16 San marzano Tomatoes for Sauce making. I had a great year,however, I ran out of sauce. Remember i made 32 quarts of sauce. No.. I didn't eat ALL of it. much was shared with my family as Christmas presents along with Strawberry Jam I made last May... ( hmm may... Jam season ) Yes I tackled Strawberry jam this weekend as well. 19 pints of Todd's Finest Strawberry Jam! Guess my Family knows what This Christmas will hold yet again..
Oops that was a tangent. This year I planted 20 San marzano plants - must have more sauce!!!! they got put in the ground today!!! Here are some photos of my garden this year. 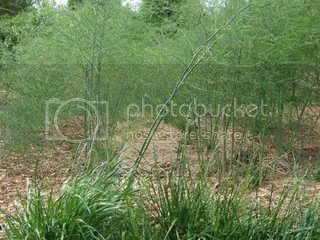 As my last posting was the first of the asparagus, here is what it looks like now fully grown. what a lovely patch. and "Nancy" a green butterhead. 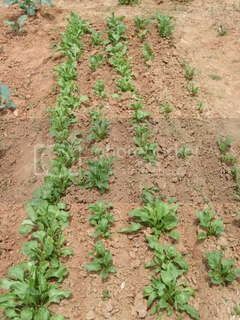 I love beets i planted my largest planting this year, 3- 10 ft rows. Chiogga, an heirloom red and white striped variety that really germinates well and doesn't turn everything red when you cook it. "Cylndria " a red beet that does turn everything red, but grows more elongated. and the ever elusive gold beet, which germinate poorly. BUT this year i finally had great germination on the gold beets. 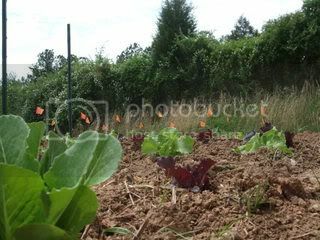 in the foreground of this photo, you will see a patch of beets growing randomly.. I spilled the seed packet. Ok, now let's talk tomatoes and peppers. First i want to share a quick photo of one of my peppers, There were aphids eating them in the greenhouse where i germinated them, Well much to my delight, when I put them outside, Mother Nature took over and is working her magic. 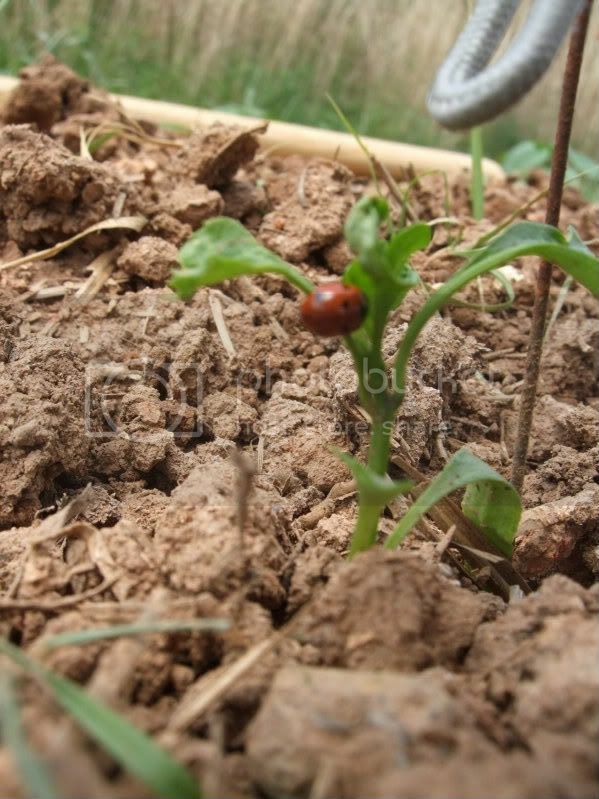 Yes that is an extreme close up of a lady bug EATING aphids off the peppers SWEET!! Ok back to the 'maters. If you look back over my garden blog 2-3 years ago I was using Bamboo- mostly because it looked cool and was, well, free if I went and cut it down. I am a cheapskate at times. Well looking good and performing good do not always mesh well. We have a tendancy here in the south to get wicked Thunderstorms in the summer with high winds. once Bamboo trellises blow over, forget about ever getting them back upright. Last year I went with Large gauge fencing and steel posts. 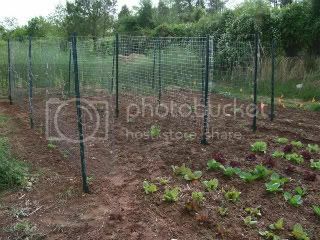 Simply plant the stakes, hook the fencing on, and when the plants grow, attach to the fence with twine. Viole!! worked like a charm. now all I need is for them to grow into the fence. over view of the whole garden. Sigh... what a lovely, lovely veggie garden. 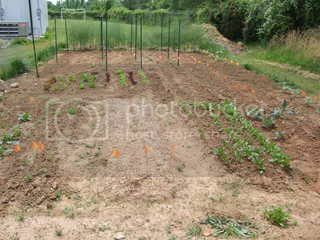 I'd love to have room for a small organized plot. I'll look forward to watching it grow. 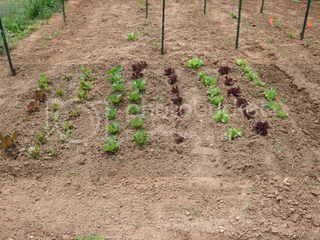 You are really going to have some great fresh yummy veggies.Looks like your lettuce is ready to make a good salad. I'll be coming over this summer for dinner! Oh-ho, your lettuces look yummy with all the nice colours in those perfect rows. 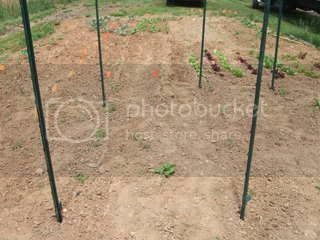 Your kitchen garden is so tidy and neat, well done. It looks like you have a great start. I'm a southern gardener too on the coast and I know what you mean about the winds. So far everythings okay. good luck, Todd. Your planning and garden are a joy to see. I love the ladybugs and seeing them and their larve do their work. Sweet revenge.